It’s been way too long — way, way, way, way too long (if anyone gets that 90s song reference, brownie points for you. And an actual brownie if I could send you one.) — since I’ve made and posted a real, legit bread recipe for you. But I hope you can forgive me because I made things like caramel macchiato muffins and Mexican chicken bakes in the meantime. And now, here we are, finally with a real, legit bread recipe. But this time, it’s extra exciting. Why? Because it’s the start of a 12-week video series I’m planning to do fer ya. Every Thursday, not only can you expect a real, legit bread recipe to be posted, but I’ll also include a super/awesome/crazy/cool video of a tip and or trick related to baking. I’ve already made a full list on my Tips and Tricks page, but I know some of us are visual learners (read: me) and I thought it might be helpful to have video clips to go with each tip. Plus, videos are way more super/awesome/crazy/cool than me just rambling about how you can bake bread. Way, way, way, way more — OK, I’ll stop. So anyway, let’s talk about the bread first, and then let’s roll the video. So this bread — it’s good. Like, really good. Not only is it no-knead (all my fellow lazy baker peeps say holla! ), the exterior is crusty while the interior is soft (my FAVE). The toasted grains — or in my case, seeds and grains — give the bread an added earthiness in terms of flavor and also add a little oomph in the texture department. If you’re like me, you’re the girl who picks out the “textured” breads from the bread baskets at restaurants — the crunchy ones, the crusty ones, the ones with seeds inside or on top. Ain’t nobody got time for those plain, monotonous rolls. Anyway, this is most definitely a “textured” bread. Two things: One, when you test the bread I suggest you take it completely out of the oven and close the door again quickly before testing it so the oven retains its temperature. Don’t be like me. And two, I apologize that you just had a peek into my very, very dirty oven. Don’t be like me. There you have it, friends! A real, legit, simple, crusty, no-knead bread and a video to boot. Next week I may or may not have a recipe for which this bread is MAJOR for the dipping. Gotta love a good dipping bread. And OK, OK, I’ll spare you the suspense. Here’s the song I was referring to, in case you couldn’t figure it out. Ah, memories. And dreads on a white man. Melt butter in a medium skillet over medium-high heat. Add grains and/or seeds and cook 5 to 7 minutes, stirring often until toasted (if the grains/seeds start to pop, you can cover the skillet). Remove from heat; cool completely. In a large bowl, stir together yeast, salt and warm water. Stir in flour and toasted grains with a wooden spoon until a dough forms and no dry parts remain. Cover bowl with lightly greased plastic wrap. Let rise in a warm place until doubled, about 2 to 3 hours. Punch down risen dough. Divide dough in half; reserve one half in a covered bowl in the fridge. * Lightly dust a surface with flour and shape dough on surface into a round loaf. Lightly sprinkle cornmeal on a pizza peel or the back of a baking sheet; transfer loaf to peel. Cover with lightly greased plastic wrap or a tea towel and let rise 40 minutes to 1 hour until puffy. When dough is halfway through its second rise, heat oven to 450 degrees F. Place a broiler pan on the bottom rack of the oven and a baking stone on the middle rack. Let the stone heat for 20 minutes. Dust top of loaf with flour. Using a serrated knife, lightly score top of bread three times. Slide bread from peel onto stone. Pour 1 cup hot water into the broiler pan and quickly close oven door. Bake bread 30 minutes until golden brown and tested for doneness. *The second loaf can be stored in a covered container in the fridge for up to 2 weeks. If you want to bake both loaves the same day, leave the second loaf out for a full hour (instead of 40 minutes to 1 hour) before you plan to bake it, then proceed as directed. Gorgeous! 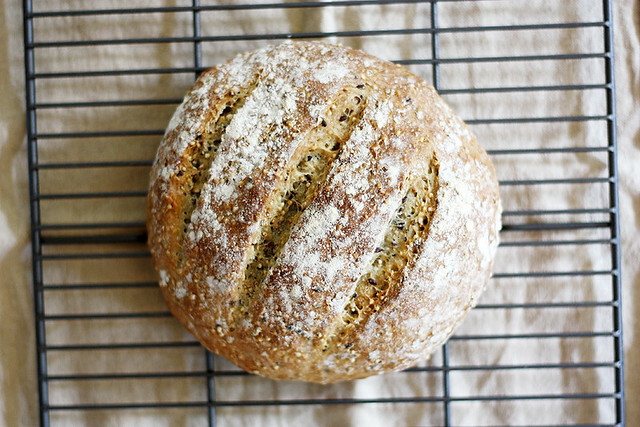 And I love that it’s no-knead and has all those seeds & crunchies! Stunning!! I love baking bread and especially grainy, seedy bread!! I love that every Thursday I get to look forward to bread! YES!! 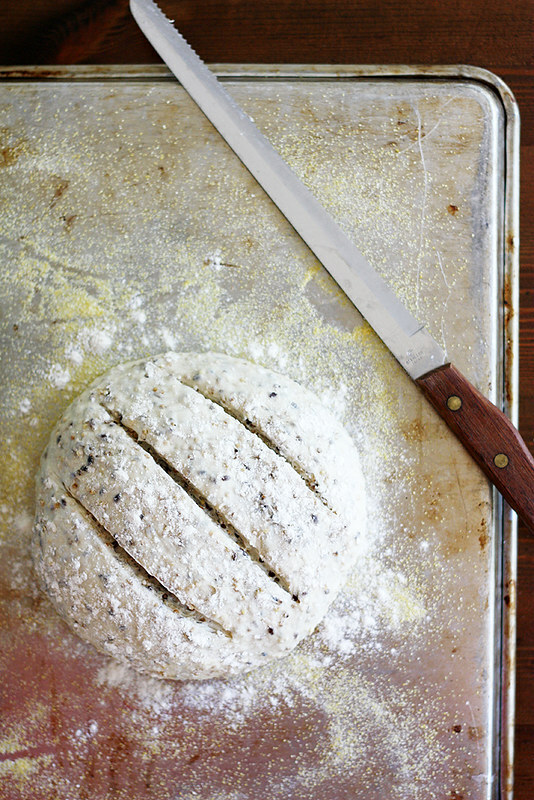 It is my mission to bake more bread this fall, and I love crusty, seed-laden breads, so this one is going on my list! This looks just like the loaf we bought at the local grocer yesterday morning here in Busingen, Germany! Now I can make my own! What a gorgeous loaf! It looks easy and healthy, too – what a great recipe! Yay for legit, no knead bread. It looks wonderful, and I love that you’re doing a video series. Can’t wait for more. Yay video!!!!! So awesome & inspiring, and can’t wait to see the rest of the series! 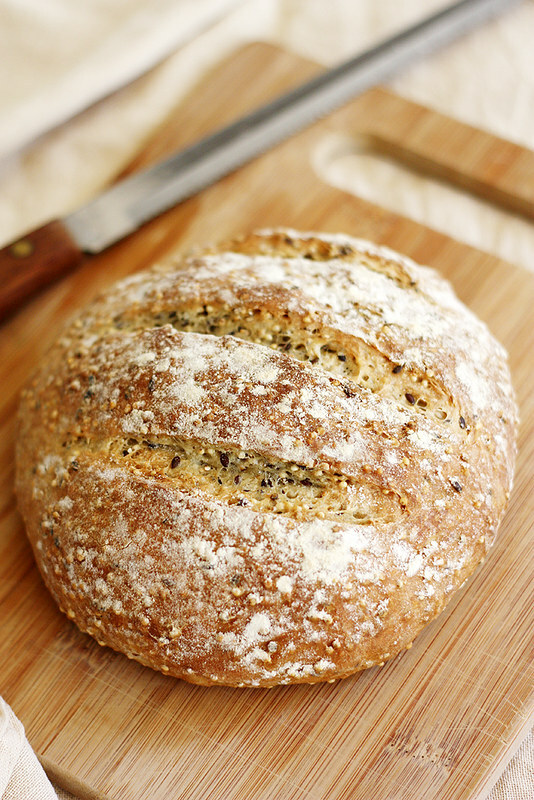 Crusty bread full of grains and seeds is totally my jam, and my lazy side loves the no-kneading!! Belinda — Judging by all the magical things you make on your blog, no-knead bread would be a total cinch for you. 🙂 You should just give it a try! Tieghan — Thanks! Wish I could share some with you (in part so I can get some of these carbs outta my house ;)). Erika — There is nothing wrong with biscuits alldayeveryday. 🙂 Thanks, homie! Janet — How fun! You’ll have to let me know how this version compares to what you bought! I love bread with crunchy bits — theyre the best part! This sounds amazing. Jennie — Thank you! I’m excited to share the series with you! Grace — Hahaha, it’s still in my head, so good luck 😉 Thanks so much for pinning the recipe! Kelli — Right? Gotta love a good lazy bread. 🙂 Thanks, friend! Kelly — I agree! Nothing beats a good texture. 🙂 Thanks, dear! 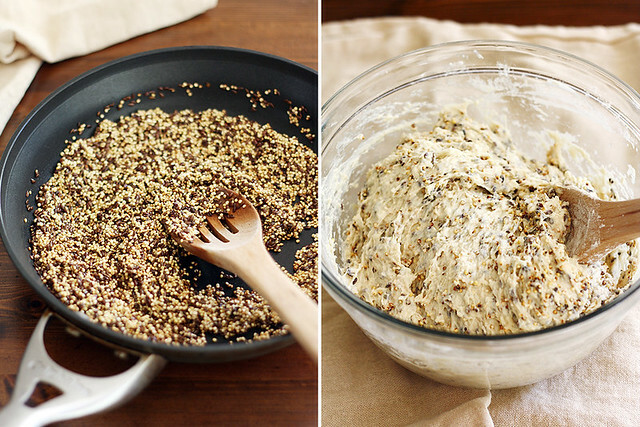 I’m obsessed with hearty, seeded bread, so this looks right up my alley! The no-knead bread method is a amazing; I use Zoe’s no-knead flatbread recipes at least once a week for pizza. I’m so happy I found your blog – love the recipes, photos, and the fact that you’re a fellow Minnesotan! I am a great fan of no knead bread! And whole grains make such a savory and healthy loaf! Oh this looks great! For some reason I’ve never been able to get up the nerve to bake yeasted bread. 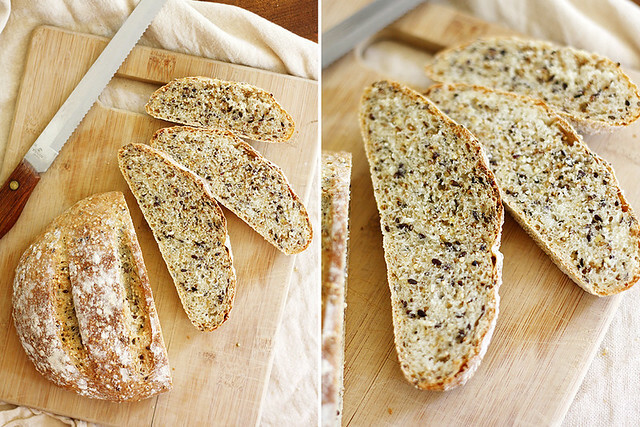 But this looks so simple and I love the texture of multigrain breads. I’ll have to get over my fear and try it! Ummm HOLLA! I love no knead bread and love finding new ways to fancy it up. I’m all about the toasted seeds and grains. The Mr? Not so much. Oh well, it means there will be more for me! Hahahaha! Oh dreads on a white man. Gotta love the good ol’ Counting Crows. Mr. Jones is still one of my top fave all time jams! Anyway, the bread video! So cute, good for you attempting video. I so want to try it. I love the seedy heartiness of this bread. Katie — Hey there, fellow Minnesotan! 🙂 I love Zoe’s method for baking bread, too — it never fails me. Deb — Haha, thanks for the forgiveness about my dirty oven. 🙂 You’re so right — we need more time to bake! Courtney — I kind of love it when that happens; when the husband doesn’t like something then I know it can be mine, all mine. 😉 Thanks! Stefanie — Yes! I definitely listened to that whole album right after I wrote this post. 🙂 And thanks about the video — I know it’s nothing fancy, but I’m starting with baby steps! Consuelo — Right? Textured breads are where it’s at. 🙂 Thanks, dear! Kate — Hmm, that is interesting. I just use the top of an old metal casserole dish from my great-grandmother as a broiler pan and I pour the cup of hot water in there (and it doesn’t get damaged). But yeah, anything beat up from the thrift store would be perfect, too! This looks amazing! I’ve wanted to try the no-knead technique for so long, and your version looks amazing. Pinned! What a lovely gorgeous loaf! And the video is fantastic. This would taste just amazing with a big bowl of soup! Great video! That is one gorgeous loaf! I love whole grain breads with the seeds and nuts!! Yes! Videos! I love it! Teach me howwwww. Julie — Thank you so much! Laura — I can’t wait to share more! 🙂 Thanks, friend! I WISH I could make bread like this. I can’t 🙁 For some reason, bread and I aren’t friends. But I would gladly come over for a slice! Omgosh this looks like my FAVORITE loaf of bread from the grocery store!! I <3 all those seeds. I am absolutely bookmarking this to try, thanks! Erin — Haha, it’s been two days and it’s still stuck in my head. Gorgeous gorgeous gorgeous! I just want to slather that loaf with some buttah and inhale it! Am I SO proud that I knew it was Counting Crows? Yes. Yes I was. Love them. And I love that video! I always tap my bread for the hollow sound but sometimes I second guess that I know what hollow would sound like lol. Also, gorgeous loaf! Love all those crunchy bits. Laurie — I totally support that plan. 😉 Thanks, darlin’! WHOA! This bread looks awesome! And I am super excited about the legit bread action that will be happening here each week, and the video action too! Is there a chance, that this recipe would work with spelt-flour instead of all-pourpose flour? 🙂 My brother is allergic to wheat and sifted spelt flour is the most wheat-likely flour, isn’t it? Cecilie — Oh, I wish I knew for sure but I don’t! You can definitely at least give it a try, or go for a gluten-free all-purpose flour mix, which is what I use when I bake GF. I need to get down with some bread baking action. Lovin this! So I have tried to make this a couple of times now… No idea what I’m doing wrong but each time the dough has hardly risen at all the second time around. It has been like brick bread. Any ideas? Olivia — Oh no! I’m so sorry to hear that. When you go to stir the dough together, you’re not adding any extra flour, right? The dough will be quite loose, a lot moreso than what you may be used to with other breads. Also make sure you don’t stir it too much; just stir until no dry parts remain. You may also be letting the dough rise too long the first time. If it rises too long, the yeast can go dormant. Also, if you’re not already doing so, I’d suggest only using active dry yeast for this recipe instead of instant yeast, and make sure it’s fresh and not expired. Just tried this bread this past weekend and it was great! Loved the texture and the nutty flavor of the toasted seeds – it’s great with a shmear or peanut butter. My husband loved it too. I just had one issue – I let it rise the second time and it was a very nice shape, but when I tried to add the slits to the top of the loaf just before baking, it deflated! The bread then came out rather flat. I have the other half of the dough to still make – I wonder if making the slits *before* the 2nd rise would help? Or perhaps my cuts were a bit too deep? Emily — Yay, I’m so glad you like it! As for the slits, I’d try making the cuts less deep and maybe only make one or two small slits — just enough for the bread to expand without breaking, but not enough to deflate (which, by the way, happens to me all too often). Hope that helps! This is probably a very silly question, but if I only need 1 loaf, may I half the recipe? Or will that affect the bread? Sorry, I’m a first-timer at baking homemade bread! Hannah — Not silly at all! Yes, if you want only 1 loaf, make sure to halve every ingredient. Happy baking! So I am cooking thanksgiving dinner tomorrow for the family and I was planning on making this bread. Unfortunately, it looks like my grandmother doesn’t have any kind of stone for the oven! Any suggestions? Natalie — Yay! You can use a baking sheet in place of a baking stone. Happy baking and happy Thanksgiving! Could this be made in a dutch oven instead of on a stone? Terica — I’ve never done it that way, but it’s worth a try! I made this recipe today and cooked one loaf in a dutch oven- and one with the steam method described in the original recipe. I also cooked a loaf using the no knead white bread recipe found elsewhere on this site and just added a cup of seeds. For that recipe- I followed it precisely- and only added 1 cup of seeds. Use the crusty no knead bread with toasted grains recipe- but cook it for 30 minutes in a covered dutch oven at 450• remove lid and cook for another 5-10 minutes until crust is done. The steam/ stone method made a short flat loaf with a great crust- but the interior was not as fluffy/ full of holes as using a dutch oven. The other recipe had a great crust- but the interior was very dense.